When you can measure what you are speaking about, and express it in numbers, you know something about it; but when you cannot express it in numbers, your knowledge is of meager and unsatisfactory kind; it may be the beginning of knowledge, but you have scarcely in your thoughts advanced to the sate of science. Anything can be measured. If something can be observed in any way at all, it lends itself to some type of measurement method. No matter how "fuzzy" the measurement is, it's still a measurement if it tells you more then you knew before. 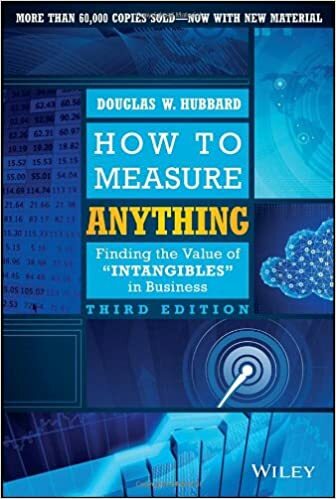 Like many hard problems in buseiness or life in general, seemingly impossible measurements start with asking the right questions. Then, even once questions are framed the right way, managers and analysts may need a practical way to use tools to solve problems that might be perceived as complex. It is simply a habit to default to labeling something as intangible. Why do we care about measurements at all? The first reason--and the focus of this book--is that we should care about a measurement because it informs key decisions. Second, a measurement migh also be taken because it has its own market value and could be sold to other parties for profit. Third, perhaps a measurement is simply meant to entertain or satisfy a curiosity. Unless someone is planning on selling the information or using it for their own entertainment, they shouldn't care about measuring something if it doesn't inform a significant bet of some kind. So don't confuse the proposition that anything can be measured with everything should be measured. Determine what you know now. The lesson for businesses is to avoid the quagmire that uncertainty is impenetrable and beyond analysis. Instead of being overwhelmed by the apparent uncertainty in such a problem, start to ask what things about it do you know. Executives often say, "We can't even begin to guess at something like that." They dwell ad infinitum on the overwhelming uncertainties. Instead of making any attempt at measurement, they sometimes prefer to be stunned into inactivity by the apparent difficulty in dealing with these uncertainties. Yes, there are a log of things you don't know, but what do you know? Usually things that seem immeasurable in business reveal themselves to much simpler methods of observation, once we learn to see through the illusion of immeasurability. Concept of measurement. The definition of measurement itself is widely misunderstood. If one understands what "measurement" actually means, a lot more things become measurable. Object of measurement. The thing being measured is not well defined. Sloppy and ambiguous language gets in the way of measurement. Methods of measurement. Many procedures of empirical observation are not well known. If people were familiar with some of these basic methods, it would become apparent taht many things thought to be immeasurable are not only measurable but may already have been measured. In addition to these reasons why something can't be measured, there are also three common reasons why something shouldn't be measured. The economic objection to measurement (i.e., any measurement would be too expensive). The general objection to the usefulness and meaningfulness of statistics (i.e., "You can prove anything with statistics"). The ethical objection (i.e., we shouldn't measure it because it would be immoral to measure it). If we incorrectly think that measurement means meeting some nearly unachievalbe standard of certainty, then few things will be measurable even in the physical sciences. Measurement: A quantitatively expressed reduction of uncertainty based on one or more observations. The receiver of information could be described as having some prior state of uncertainty. That is, the receiver already knew something, and the new information merely removed some, not necessarily all of the receiver's uncertainty. This "uncertainty reduction" point of view is what is critical to business. Major decisions made under a state of uncertainty--such as whether to aprovove large information technology (IT) projects or new product development--can be made better, even if just slightly, by reducing uncertainty. Such an uncertainty reduction can be worth millions. So, a measurement doesn't have to eliminate uncertainty after all. A mere reduction in uncertainty counts as a measurement and can potentially be worht much more than the cost of the measurement. Once mangers figure out what they mean and why it matters, the issue in question starts to look a lot more measureable. The clarification chain is just a short series of connections that should bring us from thinking of something as an intangible to thinking of it as intangible. If it matters at all, it is detectable/observable. If it is detectable, it can be detected as an amount (or range of possible amounts). What do you mean by ? Business managers need to realize that some things seem intangivle only because they haven't defined what they are talking about. Figure out what you mean and you are half way to measuring it.